We are dedicated to staying on the cutting-edge of Taekwondo training. Our association hosts and enters competitions has regular seminars and workshops. Senior students are classified as sixteen years old and over. Our students are taught in a safe, friendly and positive environment with certified Kukkiwon instructors. Our program is designed to meet the needs and challenges of today’s active adult. From a seasoned martial artist to the adult/senior who is brand new to martial arts…we’ve got you covered. Many of our senior students have attributed success in their personal careers to the self-discipline and mental focus gained through their martial arts training. Our instructors take pride in passing on realistic self-defense techniques and physical fitness strategies, while teaching our classes with the fresh, unique and modern approach it demands. Rank Certified Taekwondo – Our instructors have trained for many years to make sure everything we teach is reality based. We’ve trained under some of the best martial artists in the world and are dedicated to staying on the cutting-edge of REALISTIC martial arts training – for ourselves and for you. Self-Confidence and Self-Esteem – Many times when we think about the benefits of martial arts – self-esteem, respect, self-discipline and focus – we generally associate them with children and not adults. The reality is that our martial arts programs have the same benefits for kids and adults alike. We believe all levels of martial arts are built upon the same philosophy and nothing can take the place of the security in knowing that you can defend yourself should the need ever arise. 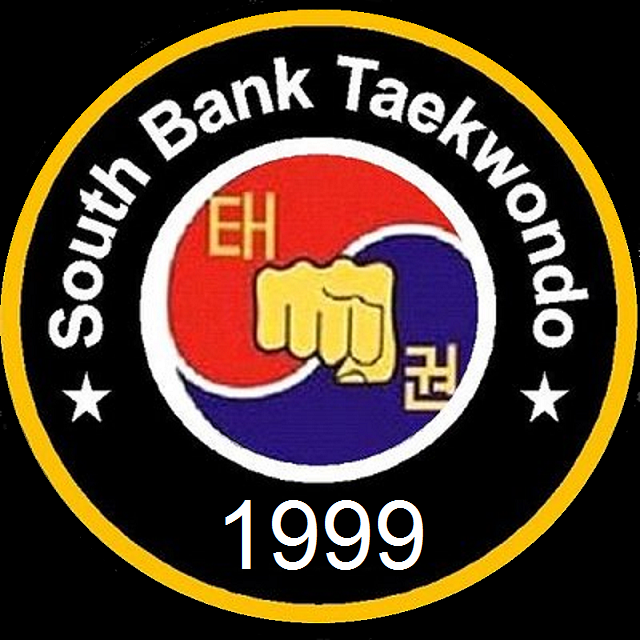 Improved Mental Focus and Increased Energy – Taekwondo with South Bank means much more than just self-defense. It also builds mental focus. Our adult classes will help you maintain control over yourself. It teaches you to handle emotions, stay calm, be persistent and provides you with the tools and willpower you need to stay focused. The physical activity derived from our curriculum will help you find reserves of energy you didn’t realize you had. Through the discipline of our program, you will learn to channel that energy into productivity at home and in the workplace. Strength and Conditioning – Taekwondo is not simply just for fighting: new research published in the British Journal of Sports Medicine shows that people in their 30′s, 40′s and 50′s who regularly practice martial arts demonstrate astounding levels of physical fitness in comparison to people the same age who don’t exercise at all. The study subjects who practiced martial arts had 12% less body fat, were able to do twice as many sit-ups, had enhanced flexibility and leg strength, demonstrated a stronger immune system and showed greatly improved balance. It’s not surprising that martial arts has long been known to confer tremendous anti-aging health benefits to their followers. Throughout Asia, it’s not uncommon to see large groups of elderly (people in their 60′s, 70′s and 80′s) practicing martial arts at sunrise in the community parks. Despite their age, these people have better aerobic conditioning, balance, strength, flexibility and coordination than many typical Americans in their 30′s who are already suffering from chronic diseases like diabetes, obesity and cancer. People who practice martial arts simply don’t experience those diseases with anywhere near the frequency. As a result, they are stronger, better conditioned and live longer, healthier and happier lives. We encourage you to take advantage of our family discounts and free trial lesson…try us out while meeting friendly staff, parents and students. If you have any questions about our programs, feel free to contact us. Thank you for your interest...we look forward to hearing from you. Full Body Flexibility, Balance and Coordination – These are some of the most overlooked benefits of our adult program. You will achieve greater flexibility of your muscles, joints and ligaments. Flexibility is a positive “Double Edged Sword” with improvement to your posture and an enhancement to your ability to move through a full body range of motion. These benefits will also help you age in a healthier way while improving the overall quality of your life. Weight Loss and Weight Management through Martial Arts – Because of the greater intensity in the strikes and kicks of Taekwondo, you will be subjecting your body to more aggressive movements. This results in intense calorie burning… which then results in natural weight loss and an improvement in overall physical and mental health. 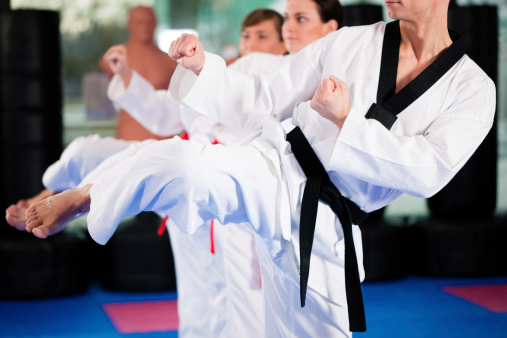 Our Taekwondo classes will teach you to practice your set of movements until you have the correct form down pat. This kind of mental focus and discipline can easily be carried over into forming the mental toughness you need to push yourself… while achieving your weight loss goals at the same time. Reduced Anxiety and Stress Levels – Feeling stressed out? No need to look beyond our adult program. Psychologists have found positive correlations between training in martial arts and lower levels of hostility, aggression and better yet…higher levels of self-esteem and positive mental attitudes compared to any other sport. We understand that cutting stress and learning to handle yourself both physically and mentally are important benefits that you can take advantage of in your everyday life. Personal Attention – We know the impact a good instructor can have on a student. Our Rank Certified Instructors are experienced, patient, enthusiastic and teach with a perfect blend of discipline and fun. Every student receives the personal attention they deserve. Have Fun – We learned a long time ago that people learn faster when they are having fun. Keeping students interested in their training requires an element of fun. Traditionalists are usually only concerned with the discipline and structure of their training, but incorporating fun involving proper techniques will add to the value of training and keep students hungry to improve themselves even more.